Aarão Ferreira de Lacerda was born in S. Sebastião do Touro, in the municipality of Vila Nova de Paiva, on 3 October 1863. He studied Philosophy at the University of Coimbra, where in 1886 he took the exam "Theses de Phiolosophia Natural" [Theses on Natural Philosophy], on 3 July, and presented the Inaugural Dissertation entitled "Equações Geraes da Thermodynamica" [General Equations on Thermodynamics], defended on 30 October, before a jury chaired by António dos Santos Viegas. The following year, he was appointed substitute teacher of the Department of Philosophy of the Polytechnic Academy of Porto (by decree of 7 April, and royal charter of 10 November 1887). In 1890, he rose to the position of teacher of the 11th Chair – Zoology, at that Academy (by decree of 6 February and royal charter of 19 March 1890), with the presentation of a dissertation entitled "As Protallophitas" [Prothallophytas]. Between 1896 and 1897, he briefly embraced politics as office member for the Lamego constituency. At the end of the mandate, he returned to the Academy. To improve the teaching of Zoology, he sought more thorough knowledge on Anatomy and Human Physiology at the Porto Medical-Surgical School where he excelled and completed the course with the inaugural dissertation entitled "Breves considerações acerca d’alguns casos de paralysia geral" [Brief considerations on some cases of general paralysis] (Porto, 1905), supervised by Maximiano Lemos. He was later transferred to the 20th chair– 2nd chair of Mineralogy (by decree of 19 May 1910). In 1911, he was placed in the 1st group of the 3rd Department of the Faculty of Sciences, University of Porto. From that date until he died, he headed the Group of Geological Sciences and the Mineralogy and Geology Museum and Laboratory of the FCUP. He again addressed the theme of his thesis at the 15th International Congress of Medicine, with a paper entitled "Le traitement mercuriel intensif de la paralysie générale" [The intensive mercurial treatment of general paralysis]. Among other works, he wrote the booklet "Breves considerações sobre alguns factos da hereditariedade" [Brief considerations on some facts on heredity]. 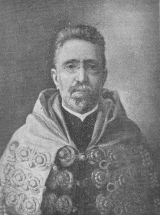 Lacerda has contributed greatly to the study of Peninsular Geology, through a paper presented to the Congress of Seville (1917), and to the dissemination of Zoology. He was one of the promoters of the Portuguese Society of Anthropology and Ethnology, and represented the Polytechnic Academy of Porto in the Darwinian celebration in Cambridge. As a doctor, he helped his friends and the less favoured, to whom he never refused to provide assistance. He was married to Josefina Cândida Moreira and they had a son Aarão Soeiro Moreira de Lacerda (1890-1947). He died in Porto on 16 January 1921.